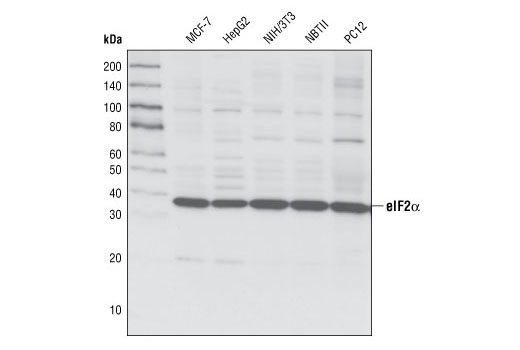 Western blot analysis of extracts from various cell types using eIF2α (L57A5) Mouse mAb. 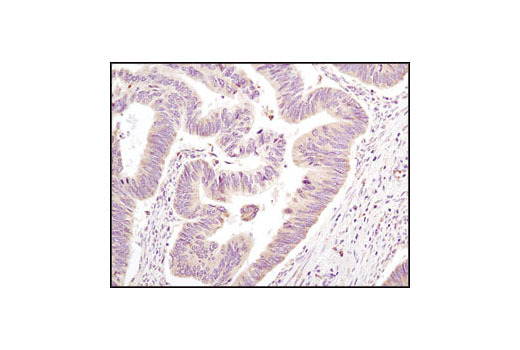 Immunohistochemical analysis of paraffin-embedded human colon carcinoma using eIF2α (L57A5) Mouse mAb. 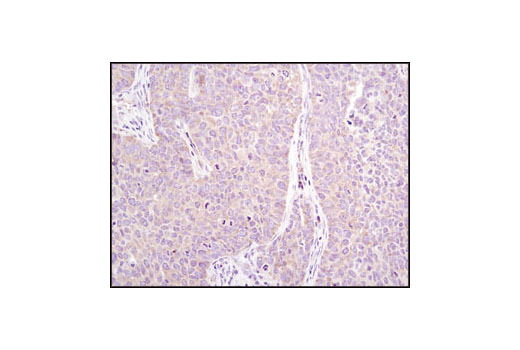 Immunohistochemical analysis of paraffin-embedded human lung carcinoma using eIF2α (L57A5) Mouse mAb. eIF2α (L57A5) Mouse mAb detects endogenous levels of total eIF2α protein. Monoclonal antibody is produced by immunizing animals with purified recombinant human eIF2α. Phosphorylation of the eukaryotic initiation factor 2 (eIF2) α subunit is a well-documented mechanism to downregulate protein synthesis under a variety of stress conditions. eIF2 binds GTP and Met-tRNAi and transfers Met-tRNA to the 40S subunit to form the 43S preinitiation complex (1,2). eIF2 promotes a new round of translation initiation by exchanging GDP for GTP, a reaction catalyzed by eIF2B (1,2). Kinases that are activated by viral infection (PKR), endoplasmic reticulum stress (PERK/PEK), amino acid deprivation (GCN2), or heme deficiency (HRI) can phosphorylate the α subunit of eIF2 (3,4). This phosphorylation stabilizes the eIF2-GDP-eIF2B complex and inhibits the turnover of eIF2B. Induction of PKR by IFN-γ and TNF-α induces potent phosphorylation of eIF2α at Ser51 (5,6).